Steamline Luggage Throwback Alert: If you’re going to have to lug a suitcase around, you might as well look fabulous doing it. Give a nod to old school glam with The Correspondent by Steamline Luggage, available in a wide variety of colors. eBags Budget Friendly: Save your money for the trip! Get back to basics with this classic style from American Tourister. Bluesmart Go Mod: Meet Bluesmart, the suitcase that will charge your devices, alert you if you leave it behind and weigh itself. Bluesmart even provides a lost luggage concierge service. The service requests an Uber driver who will then pick up luggage that has gone astray and deliver it to you. Tumi Indestructible: Tough on your bags? If so, then this is the case for you. Made from Tegris, a material used in lifesaving armor, Tumi’s bags have a reputation for being functional, stylish and durable. Louis Vuitton Always in Style: This bag will set you back a few, but it will never go out of fashion. The iconic monogram bag from Louis Vuitton sets the tone for any vacation. The golden era of travel, when flying was akin to attending a glamorous cocktail party, is gone. Maybe it was when we began getting squeezed into tighter spaces or charged for our baggage then nickel and dimed for our food that something subconsciously sparked in our minds. “They don’t care about us, so we don’t care about this experience.” How else can we explain duct taped luggage rolling out of baggage claim, grown-ups wearing pajamas in public or the masses strolling about with donut pillows attached to their necks? C’mon—you’re chicer than that. Or, at least, you could be. Today’s retail market offers countless options for travel gear. 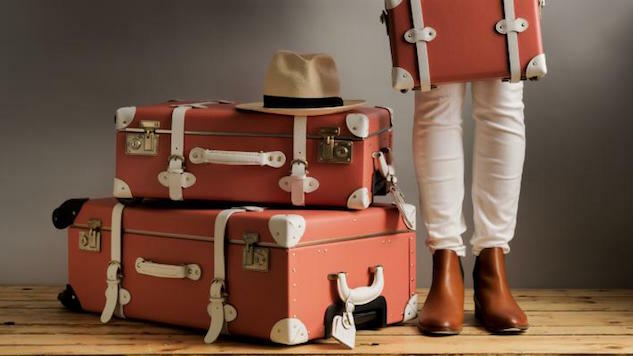 The design and construction of luggage has been shaped by advancements in travel. “The first transatlantic passenger flight took place on June 4th 1927, carrying travelers from New York to Germany,” wrote Helenka Gulshan in Vintage Luggage. “Vulcanised fibre, raffia, wicker and lightweight metal alloy cases were favoured for use in early commercial air travel, since a combination of lightness and strength was of paramount importance.” As commercial flights replaced steamships and airplanes dictated baggage stow-size limitations, suitcases began replacing cumbersome steamer trunks. Similarly, the expansion of the automobile industry, and its newfound accessibility to the masses, led to changes in luggage design. Travelers rarely carried their own luggage to and from the plane, even as jet travel became more widespread in the late 1950s. But, as mass aviation took flight, wheeled suitcases became a necessity. Baggage handling became more problematic as travelers started handling their own luggage, replacing porters and larger terminals necessitated longer walking distances. Bernard Sadow is credited with inventing rolling luggage in 1970, with a patent granted in 1972. The patent application cites “baggage handling (having) become perhaps the single biggest difficulty encountered by an air passenger,” as the background of the invention. Rollaboards, suitcases featuring two wheels and pulled in an upright position, replaced Sadow’s four-wheeled versions when Robert Plath, a Northwest Airlines pilot invented them in 1987. Today, aviation continues to rule luggage design. Weight restrictions and baggage fees are now commonplace, causing people to pack with purpose and intention. Luggage manufacturers are forced to release new, innovative models to stay competitive, keeping cases light while incorporating ergonomics and technology. You can check out some of our favorites in the gallery.